In some ways, this time of year seems fairly normal. 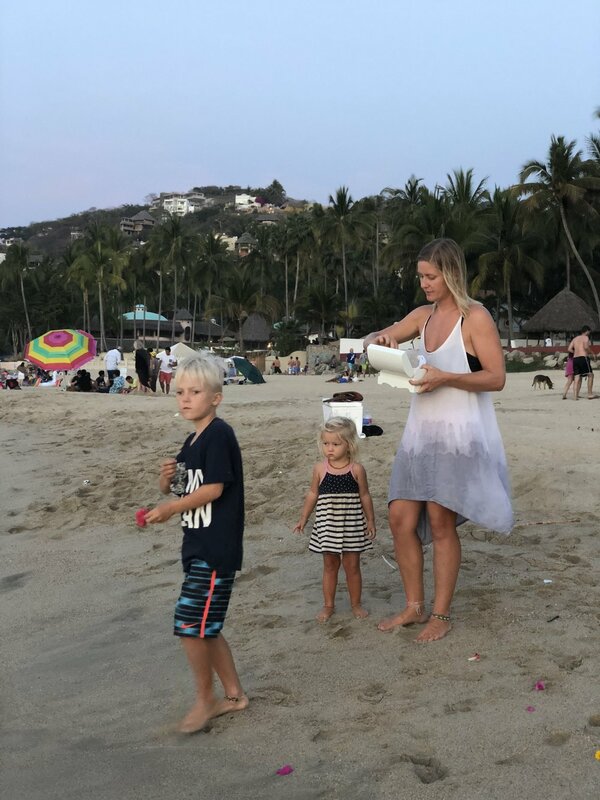 On most days we get up, get ready for the day, walk Arjuna to school, and I hang out with Lux, Josh goes to work, and in the evening we surf or play soccer on the beach. But we have been taking some special time this past month to look at our favorite Zama photos and share our favorite memories of her. It’s now been 3 years since we lost our second daughter just before she would have been 2, and we celebrated her 5th birthday on March 25. As a family we celebrated Zama's birthday with our tradition of throwing pink flowers and some of her ashes into a body of water wherever we happen to be. We also make chocolate cake, sing happy birthday and blow out candles. These are some photos of the celebration and some inspiration from Zama. Lux was born 10 months after Zama died, but her sister has always been part of her reality and will always be a part of our family. She knows exactly who Zama is and recognizes each photo of her. Actually, sometimes she gets confused and thinks that photos of her are actually of her sister and vice versa. Since we got pregnant with Lux so soon after losing Zama, for all of us, they share a special connection even though we recognize them as their own unique individuals. Maybe Lux is too young to notice that Zama isn’t in our lives in the same way as the rest of the family. But maybe because of her age, she’s also so much wiser and more connected than the rest of us, and she feels her sister’s presence in a more pure unadulterated way that our rational minds sometimes prevent. Arjuna has distinct memories of Zama. He likes to tell his favorite Zama stories over and over, keeping her memory alive. We also like to imagine what Zama would be doing in certain situations. Even at 7 years old, he sometimes closes his eyes and tells us what Zama is doing in “Angel Land.” I think he likes teaching Lux about her. For me, after 3 years, my experience of Zama in our lives continues to shift. Since last year when I wrote about how I want to continue to talk about Zama and remember her, I find myself holding Zama a little closer to my heart. My memories of her have gotten more personal, and the whole experience of losing her feels a little more private. In the first year after losing her, when we started traveling, we felt some duty to be very public about experiencing the death of our child. We didn’t decide to travel because Zama died, but it definitely brought the finite nature of reality to the forefront and inspired us to move more quickly toward our dreams. So in some ways, the experience of losing her and our motivation to change our lives so quickly were intertwined. Often, our decision to travel and our experience of profound loss often came up together. One of the most important insights we learned from our sessions with a Cree Shaman and a trauma counselor in the months after Zama died, was that it might feel at first like being in grief and sadness is the only way to connect with Zama, but the best way to keep her spirit alive is to embody what she was on earth, which is pure joy and light. That is the most helpful and insightful thing for me to keep in mind as time passes and the nature of our relationship with Zama, and with our memories of her continues to shift as we move through life. It’s useful to reflect on how much flow there is in our thoughts, feelings, memories, and how we experience Zama over the past few years. And the fact that these things are shifting and changing as we continue to grow as individuals and as our consciousness evolves, is encouraging. We have always known that just because Zama isn’t here in her body, she is still with us always. These are just some thoughts I wanted to get out as we reflect on how much our beautiful daughter has inspired us in the days approaching what would have been her 5th birthday. We post some of these reflections on Zama because we know how much her little life affected those who knew her both personally and even from afar. And hopefully by sharing our experience with Zama, she can inspire more people to live each day with the pure joy and light that she embodies for us.